Cohasset crew tops: Our Cohasset crew top is the perfect short sleeve T-shirt for a day on the golf course. with our gorgeous patterns and premium materials, you will be sure to look your best. Antigua tops: If you are looking for an adorable sleeveless top to wear on the green, the Antigua top is the right choice. its adjustable neckline will assure that both your style and comfort needs are met. Madison crew tops: our Madison crew top is simple yet sophisticated, with an updated crew neck with binding and comfy, lightweight material. Madison v neck tees: Our Madison v neck tees have a 3/4 length knit sleeve will keep you looking great on the green. Devon polo tops: our Devon polo top is the perfect match for any bottoms. if you are looking for a preppy, sporty look for your day on the golf course, there’s just no other choice. Cohasset dresses: our knee length Cohasset dress is a beautiful short sleeve dress that will keep you feeling cool and looking hot. this sporty dress is perfect for the outdoors. 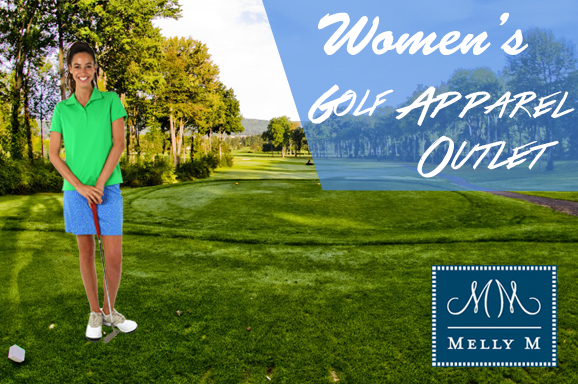 You are certain to look and feel your best in Melly M’s fashionable golf apparel both on the green and off. You can contact Melly M with any questions or comments about our golf apparel fashion line or any of our other products and a member of our team will be there to assist you with your inquiry.